Definition at line 87 of file MachineTraceMetrics.h. Definition at line 377 of file MachineTraceMetrics.h. Definition at line 54 of file MachineTraceMetrics.cpp. Definition at line 58 of file MachineTraceMetrics.cpp. 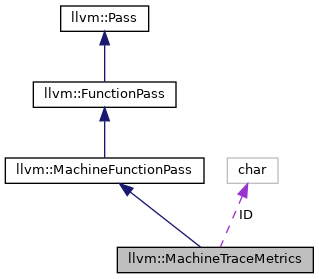 The returned Ensemble object is owned by the MachineTraceMetrics analysis, and valid for the lifetime of the analysis pass. Definition at line 383 of file MachineTraceMetrics.cpp. References assert(), E, llvm_unreachable, TS_MinInstrCount, and TS_NumStrategies. This is an array with SchedModel.getNumProcResourceKinds() entries. The getResources() function above must have been called first. These numbers have already been scaled by SchedModel.getResourceFactor(). Definition at line 144 of file MachineTraceMetrics.cpp. References assert(), llvm::SmallVectorTemplateCommon< T, typename >::data(), llvm::TargetSchedModel::getNumProcResourceKinds(), llvm::makeArrayRef(), and llvm::SmallVectorBase::size(). Compute the resource usage in basic block MBB. Definition at line 97 of file MachineTraceMetrics.cpp. References assert(), llvm::MachineBasicBlock::getNumber(), llvm::TargetSchedModel::getNumProcResourceKinds(), llvm::TargetSchedModel::getResourceFactor(), llvm::TargetSchedModel::getWriteProcResBegin(), llvm::TargetSchedModel::getWriteProcResEnd(), llvm::MachineTraceMetrics::FixedBlockInfo::HasCalls, llvm::TargetSchedModel::hasInstrSchedModel(), llvm::MachineTraceMetrics::FixedBlockInfo::hasResources(), if(), InstrCount, llvm::MachineTraceMetrics::FixedBlockInfo::InstrCount, llvm::MCSchedClassDesc::isValid(), MI, llvm::TargetSchedModel::resolveSchedClass(), and llvm::PPCISD::SC. Referenced by llvm::MachineTraceMetrics::Ensemble::getLoopFor(), and isExitingLoop(). This must be called before MBB is erased, or the CFG is otherwise changed. This invalidates per-block information about resource usage for MBB only, and it invalidates per-trace information for any trace that passes through MBB. Call Ensemble::getTrace() again to update any trace handles. Definition at line 396 of file MachineTraceMetrics.cpp. References llvm::dbgs(), llvm::MachineBasicBlock::getNumber(), LLVM_DEBUG, llvm::printMBBReference(), and TS_NumStrategies. Definition at line 79 of file MachineTraceMetrics.cpp. Definition at line 65 of file MachineTraceMetrics.cpp. References llvm::TargetSubtargetInfo::getInstrInfo(), llvm::MachineFunction::getNumBlockIDs(), llvm::TargetSchedModel::getNumProcResourceKinds(), llvm::MachineFunction::getRegInfo(), llvm::TargetSubtargetInfo::getRegisterInfo(), llvm::MachineFunction::getSubtarget(), llvm::TargetSchedModel::init(), llvm::SmallVectorImpl< T >::resize(), and llvm::ARM_MB::ST. Definition at line 405 of file MachineTraceMetrics.cpp. References assert(), Loops, loops, and TS_NumStrategies. Definition at line 96 of file MachineTraceMetrics.h. Definition at line 97 of file MachineTraceMetrics.h. Definition at line 99 of file MachineTraceMetrics.h.